Are you allowed to rave about a ‘sandwich’ shop? Difficult to say but Pistolet Original seems to be one of the places you wish you had next-door to your office (wherever that may be). 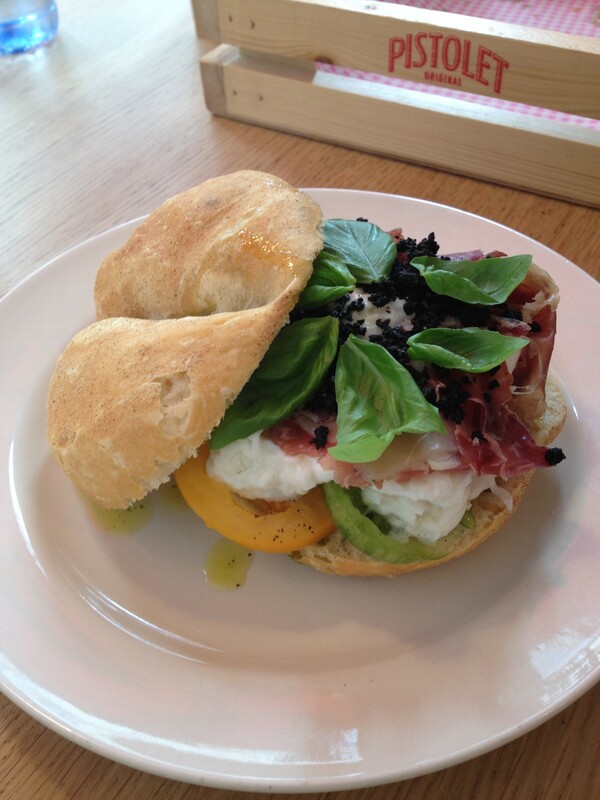 I am sure that the thought of grabbing such a great sandwich for lunch would put a smile on many faces. If there were a top 50 places list of great sandwich bars, I would say this would probably be very high up on that list. So despite having seen the name around over the past months, I had never really looked into it thinking what could be so exciting about a sandwich place? What changed everything was the trip to Dierendonck, easily one of the best butchers we have visited in Belgium. We picked up Dierendonck’s newspaper the Summer Times and in it was a small snippet about how Pistolet Original in Brussels uses his meat for some sandwiches. A quick visit to the Pistolet Original website confirmed our expectations. We became more and more excited when we read the list of suppliers. Cheese from Julian Hazard, one of the best cheese shops in Brussels and Hoevre Cuvry for pork (We haven’t been to this butcher though he is on our to-visit list as it is just outside Brussels in Dworp. Armed with all this information, we tried the Pistolet of the month. It was made with beef carpaccio from Dierendonck, burrata which presumably must have come from Julian Hazard, tomatoes, basil, black olives and olive oil. This sandwich was created by Michelin starred Stephanie Thunus of Au gre du vent. This was simply divine. The pistolet with roasted chicken from Slabbinck was also memorable. Here we are talking of the best ‘poulet curry’ that I have ever tasted in nine years living in Belgium. Anyone who has been to this country knows that this is one of the most common sandwiches you can find here. But there was nothing common about the one of Pistolet Original. 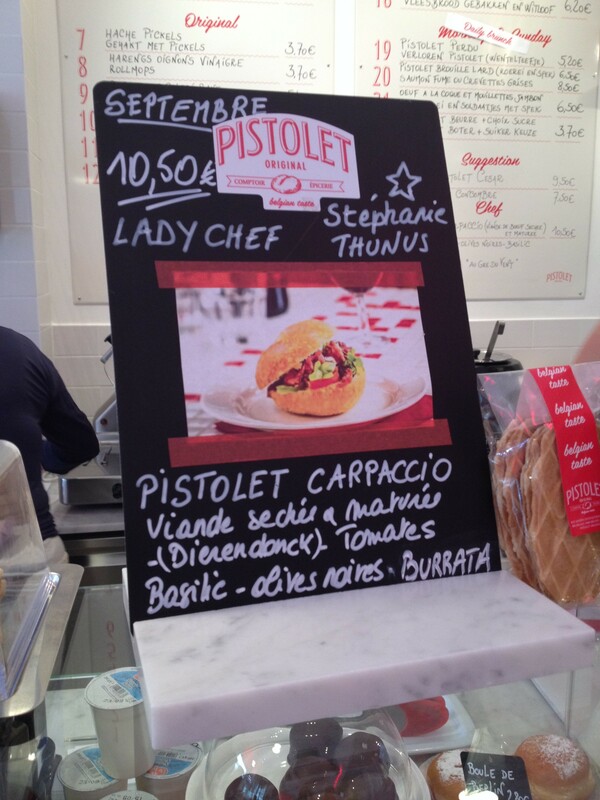 The third pistolet was a classic one with a tomato and shrimp (crevettes grises) salad. Again the flavours of the filling were exceptional. 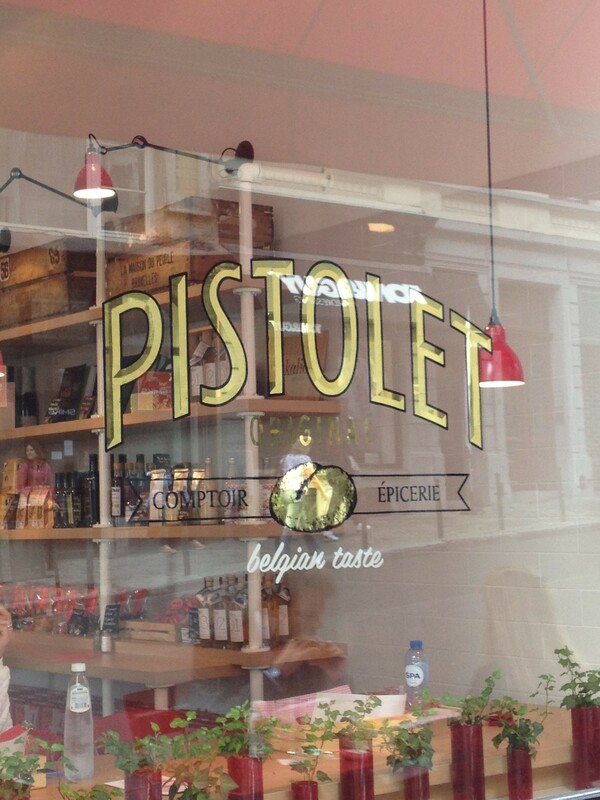 Pistolet-Original, is no ordinary sandwich place, it is a high-end delicatessen concept based on the filled ‘Pistolet’ (a Belgian-style bread roll) – and much more! It also offers a range of delicacies featuring local products which you can buy and enjoy at home. Someone that takes the provenance of ingredients so seriously deserves to be successful. We would wish many would follow in their footsteps. I tried today the “boudin blanc et oignons caramlisees” sandwinch. Just fabulous.